Summer Solstice, June 21st, is a time to celebrate our consciousness and to reflect upon our own inner light. A day when we have the most light in the year, which symbolizes the process of triumph over our shadow and darkness, and the revelation of our spiritual growth and expansion into the light. Changing habits and lifestyle choices is challenging, so in this workshop series we will explore practical tools that will inspire, empower and transform your life both on and off the mat. Examine your thought patterns and release negativity that keeps us from experiencing the richness of life. 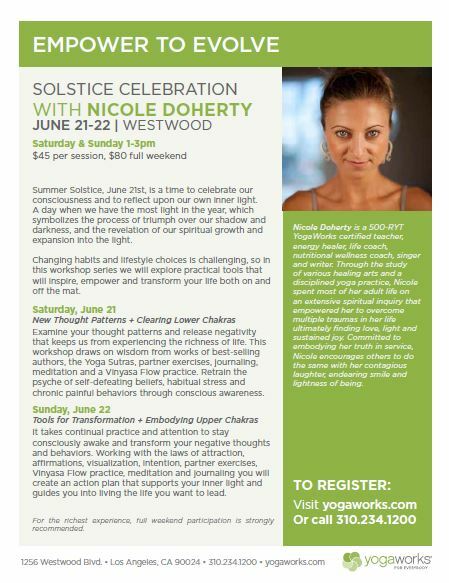 This workshop draws on wisdom from works of best-selling authors, the Yoga Sutras, partner exercises, journaling, meditation and a Vinyasa Flow practice. Retrain the psyche of self-defeating beliefs, habitual stress and chronic painful behaviors through conscious awareness. It takes continual practice and attention to stay consciously awake and transform your negative thoughts and behaviors. Working with the laws of attraction, affirmations, visualization, intention, partner exercises,Vinyasa Flow practice, meditation and journaling you will create an action plan that supports your inner light and guides you into living the life you want to lead. For the richest experience, full weekend participation is strongly recommended.